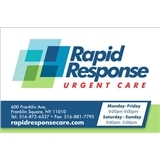 Rapid Response Medical Care (Franklin Square) - Book Appointment Online! We are a group of dedicated healthcare professionals who offer our community superior, cost effective and quick medical care. Our highly trained staff uses advanced technology to evaluate, diagnose and treat your medical complaints. We offer a friendly, welcoming environment with an experienced staff to make sure that you get the care you need. Our site offers digital x-ray, electronic medical records, paperless e-prescribe, laboratory testing, and a comfortable waiting area for friends or family. Most important is our hours. We are open 7 days a week and no appointments are ever required. Just walk in and our courteous staff will help register you for your visit. If however you wish to make an appointment at a time that is convenient for you, then please feel free. Visits to Rapid Response Urgent Care are always pleasant. The offices are clean, the staff courteous and PA Domenic was exceptionally attentive and spent a lot of time explaining my options. The only drawback was I made an appointment since I was feeling badly and thought I can get right in to see the Doctor. That was not the case. Unfortunately making the appointment did not make a difference and I ended up waiting half hour or so before being seen.